Historic goldmining town with wide street and large number of historic buildings. 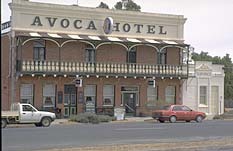 Located 181 km north west of Melbourne and 72 km north of Ballarat, Avoca is notable for its extraordinarily wide mainstreet – so wide in fact that there is a huge area of parkland in the centre which is large enough for picnic facilities, a war memorial and the occasional shady tree. Thomas Mitchell was the first European to pass through the area. He reached it in 1836 and, as rumour has it, named the local river ‘Avoca’ after a river or vale in County Wicklow, Ireland. A decade later there were a number of squatters in the area but the realchange to the district’s fortunes occurred in 1852 when gold wasdiscovered only 3 km east of the town. By 1854 the town had apopulation of 2577 and there were a total of around 6000 diggersoperating in the 6 km of riverbed south of the confluence of Glenlogie Creek and Avoca River. It was around this time that Avoca grew dramatically. Apolice camp of some 50 troopers was established in 1853 and a lock-upbuilt the following year, an impressive Bank of Victoria was built in1854 to capitalise the new-found wealth, a series of businesses set upshop, the Avoca Hotel opened its doors in 1854, the Union Hotel in1855, a Wesleyan Church was built in 1856, a National School in 1857and the courthouse in 1859. The town’s population had dropped back to 768 by 1871.The railway line from Maryborough was opened in 1876. But by this time the gold rush was all but over. Men were still making a reasonable living at Amphitheatre as late as the 1890s but the gold was now difficult to get. Slowly the farmers began to reassert themselves. By the 1870s grapes were being grown in the area and over the next twenty years mixed farming – sheep, cattle, orchards – started to dominate in the area. There were various attempts to use dredges to extract thegold and these continued intermittently throughout this century withthe last dredge only stopping operations in 1957. Today Avoca is a pleasant rural service centrecharacterised by its wide main street and the nearby Pyrenees Ranges. The Pink Lamb and Purple Shiraz Race Meeting is held in March each year. There is an Anzac Day Race Meeting in April each year and the Taltarni Cup Meeting is held in October. The Tourist Information Office is located in High Street, near the Cambridge St intersection. There is a pamphlet outlining awalking tour of the town’s historic buildings which lists around 40separate destinations. It is detailed and comprehensive and is almostentirely contained within an area of no more than five blocks by sixblocks. 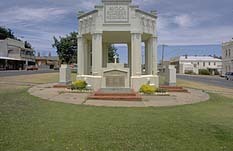 In fact, two-thirds of the sites are in High St, tel: (03) 5465 3767. Between Cambridge St and Russell St are the warmemorial, the handsome bluestone of Lalor’s Pharmacy (1854), which isreputedly the oldest continuously-operating pharmacy in Victoria, theAvoca Newsagency (c.1887), the Bakery and Tea Rooms (c.1860), AlbionHouse (c.1866) and the Victoria Hotel Complex, consisting ofstone-and-brick hotel and stone ballroom (late 1850s) and stone stables(1872). The ballroom became a venue for travelling performers. Between Russell and Duke Sts are Kelley’s Store (1865) andthe General Store (c.1860) and between Duke and North is the Avoca MeatMarket (c.1856). Between Cambridge St and Bridport St are the postoffice (1872), the former Albion Hotel (1868), Holland’s Drapery Shop (1866), Filbey’s Butchery (1856), Mackereth’s Shop and Wine Depot (c.1890), Herlihy’s Store (c.1870) and the Avoca Hotel (1870) on the site of the original Avoca Hotel (1854). At the south-eastern corner of High and Bridport is the former Bank of Victoria (1854). Its imposing facade reflects theboom period of the town’s first years. The Classical Revival brick courthouse (1859), in High St (near the Davy St corner), is one of the earliest survivingcourthouses in the state and is representative of its type and era. Itis now the headquarters of the local historical society which is proudof its excellent collection of photographs (over 2,000 and allcatalogued), family history details and reference materials. It is avital source of information for anyone wanting to explore the localarea. For more information contact (03) 5465 3744. The whole area bounded by Bridport St, Camp St, High Stand the river was the site of the original police camp established in1853 and occupied by 50 troopers trying to maintain order in thedisarray of a goldrush. Some buildings associated with the police campare to be found in Napier St, between Davy and Camp Sts. They are thecoursed bluestone lock-up (1867), which replaced the original loglock-up (1854), the police residence (1859) and the powder magazine (1860). At Rutherford and Russell is the former Anglican rectory(1894). Over the road is the Uniting Church Complex, consisting of thebrick Wesleyan Church (1867), Sunday School (1870) and parsonage (1871). At Rutherford and Duke is ‘Rutherford’ (1860s) and at124 Rutherford St is the former National School (1857 with lateradditions). One of the first to be established in the state it is aGothic Revival brick structure which is now a bed-and-breakfast. In Barnett St (between North and Duke Sts) is theimpressive Avoca State School, built of brick to a Gothic design in1878. On the Russell St corner is the Anglican Church of St John theDivine (1871). At Barnett and Bridport are Chalmer’s PresbyterianChurch (1864) and manse (1869). There are two vineyards operating quite close toAvoca. Both can be accessed by driving west on Vinoca Road which runsoff the Sunraysia Highway just north of Avoca. Blue Pyrenees Estate, established in 1963, is set in idyllicsurroundings and landscaped gardens 7 km west of the town in thefoothills of the Pyrenees (en route to Governor’s Rock Lookout).Chardonnay, pinot noir, pinot meunier, semillon, sauvignon blanc,cabernet sauvignon, cabernet franc, shiraz and merlot are all undercultivation. There are picnic facilities, al fresco lunches, an artdisplay, tours of the underground cellars and a shaded area where youcan play petanque. The cellar door is open daily from 10.00 a.m. andthe restaurant on weekends, tel: (03) 5465 3202. Mount Avoca Vineyard, established in 1970, islocated 5 km west of Avoca off Vinoca Rd in Moates Lane. It producestrioss, sauvignon blanc, chardonnay, rhapsody, semillon, shiraz,cabernet, merlot, cabernet franc, Arda’s Choice and a vintage port. Thecellar door is open weekdays from 9.00 a.m. to 5.00 p.m. and weekendsfrom 10.00 a.m. to 5.00 p.m. daily. There is a picnic area, light lunchis available on weekends and gourmet picnic lunches by priorarrangement, tel: (03) 5465 3282. Vinoca Rd is the accessroute to the site of the gold town of Percydale which flourished inthis area in the 1870s. It had a large population of Chinese diggers.Daly’s Cottage (built of vertical slabs, weatherboard, stone and brickin 1865) is about all that remains of the early days. It was recentlytaken over by the Avoca & District Historical Society. Contact (03)5465 3744 for information about inspections. The town was named afterthe police magistrate’s son although the diggings date back to the1850s when the area was known as Fiddler’s Creek after aviolin-wielding digger. 20 km north-west of Avoca, adjacent the SunraysiaHighway, is Redbank Winery, established in 1973. It produces shiraz,cabernet, a cabernet blend, pinot noir, cabernet franc, chardonnay, asparkling wine, Sally’s Paddock, Long Paddock and Hundred Tree Hill.The cellar door is open from 9.00 a.m. to 5.00 p.m. every day butSunday when it opens at 10.00 a.m. There are barbecue-picnicfacilities, a petanque piste, cheese platters and antipasto, tel: (03)5467 7255. Five wineries areclustered around the locality known as Moonambel which is an area 20 kmnorth-west on the Navarre Rd. Moonambel (Aboriginal for ‘hollow in thehills’) was part of the Mountain Creek Run in the 1840s and a townshipdeveloped in the 1850s after gold was discovered in the area. When moresubstantial finds were made around 1860 the town solidified. It isclaimed there was a floating population of up to 30 000 in the area. Asa result houses, businesses, breweries, a flour mill, soap factory,newspaper and hotels emerged. Only the Commercial Hotel (1866) remains.Although most mining was alluvial deep-lead mining continued into theearly 20th century. Orchards and vineyards were established in the1860s. Wine-making went into abeyance from 1948 to 1969 but hasre-emerged with a vengeance since that time. Summerfield,established in 1979, cultivates shiraz, cabernet sauvignon, trebbiano,chardonnay and sauvignon blanc. There is a bluestone tasting room,self-contained units for those who wish to stay, barbecue facilitiesand even a 1-km airstrip. It is 500 m on the western side of the mainroad at Moonambel and is open daily, tel: (03) 5467 2264. Opening hoursare 9.00 a.m. to 6.00 p.m. every day but Sunday when they open at 10.00 a.m.
Warrenmang Vineyard Resort, established in 1974,produces wines for the Warrenmang and Bazzani labels – shiraz,sparkling shiraz, cabernet sauvignon, merlot, cabernet franc, cheninblanc, a methode champenoise, salute rosato, chardonnay, port, saluteand traminer. To get there turn right off the Navarre Rd at the MountainCreek Rd sign and it is 500 m away. There is an award-winningrestaurant (open daily for breakfast, lunch and dinner), a bar, luxuryaccommodation (for 84 guests), a pool, spa, tennis, petanque, barbecuefacilities, gourmet picnic hampers, a children’s playground andconference-function facilities. They are open daily, tel: (03) 5467 2233. Mountain Creek, established in 1973, is adjacent theresort on Mountain Creek Rd. Cabernet sauvignon, sauvignon blanc andmuscat are the main produce. There are scenic views and a lawned areaadjacent the pool. It is open weekends and public holidays, tel: (03)5467 2230. Taltarni, established in1972, is 3 km along Taltarni Rd which runs off the Avoca-Stawell Rd, 3km from Moonambel. They produce riesling, chenin blanc, cabernetsauvignon, chardonnay, shiraz, sauvignon blanc, pinot noir, malbec andmerlot. They specialise in ‘methode champenoise’ sparkling and dry-winestyles. There is a 1-km airstrip, petanque, a picnic area in a bushsetting, barbecue facilities and a light brunch on the spaciousverandah. It is open daily from 10.00 a.m. to 5.00 p.m., tel: (03) 5467 2218. Dalwhinnie,established in 1976, is another 2 km along Taltarni Rd. The mostelevated vineyard in the Pyrenees it offers petanque and outstandingviews. The estate specialises in dry wines and produces shiraz,cabernet sauvignon, pinit noir and chardonnay. It is open daily from10.00 a.m. to 5.00 p.m., tel; (03) 5467 2388. 23 km south of Avoca isLexton. Land here was taken up by squatters as early as 1838 and one ofVictoria’s first inland townships (then known as Burnbank) wasestablished in 1845 when two men built an inn, store, blacksmith andwheelwright shop. A post office was set up in 1848 and other businessesbegan to appear. The first Anglican and Catholic services in thedistrict were carried out here in 1850 and 1851 respectively. The town’s early establishment enabled it tocapitalise when gold finds were made throughout the area from 1851 andit grew quickly. In 1852 the Lexton Hotel was built and a localresidence was converted into a courthouse and police magistrate’sresidence with police paddocks to the rear. A Presbyterian school wasestablished in 1855 and the first church was built the following year. When the gold petered out, Lexton returned to its role as aservice centre to the local pastoral industry. Remaining buildingsinclude the second courthouse (1874) in Williamson Street, St Andrew’s Presbyterian Church (1876), at the eastern end of Williamson St, and St Mary’s Anglican Church (1874) in Skene St.